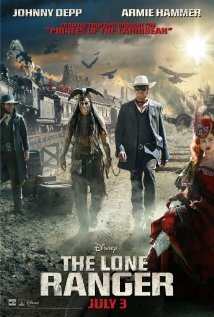 The Lone Ranger (2013), PG-13, 149 minutes - It has been years since I last saw an episode of the old The Lone Ranger television series starring Clayton Moore. I used to watch it as a kid with my dad and that old series is part of why I grew up with an affinity for westerns. Unfortunately, because it has been so long, I can't remember how campy it may or may not have been, but I do feel pretty comfortable in saying that this version of The Lone Ranger is not close to what little I do remember from my childhood. From the very first trailer I saw for this film, I thought 'why don't they just call it The Legend of Tonto?' It just seemed odd to me that you would cast one of the world's most well known actors in a supporting role. I don't mean the kind of supporting role that Captain Jack Sparrow was when the Pirates of the Caribbean films started, but the sidekick type that the role of Tonto has always fallen into. The film uses Johnny Depp's Tonto to frame and narrate the story. I can't say as I personally remember ever seeing/hearing The Lone Ranger's origin story, but one is told here. John Reid (Armie Hammer), The Lone Ranger-to-be returns home after traveling east to pursue an education as a straight laced lawyer. His views of order and justice clash with the ways of the west, leading him to follow his brother Dan's (James Badge Dale) group of Texas Rangers in pursuit of the outlaw Butch Cavendish (William Fichtner). He is killed by Cavendish and mistakenly revived by Tonto who was hoping to revive Dan to help him in his own tracking of Cavendish. Through his partnership with Tonto, John learns that while things are not black and white like he once believed, that he can still fight for good and for justice within that grey area. The Lone Ranger isn't a horrible movie, but it certainly isn't what I was hoping for. It pretty much plays out just as I would have expected after first learning that Johnny Depp was cast to play Tonto. Which is unfortunate really. Nothing against Depp, but he's far too big a name to play a supporting character. Armie Hammer plays a likable Lone Ranger, a bit stiff at first, but one that grows on you. He's just overshadowed and it really feels as though he is the sidekick and Tonto is the lead instead of the other way around. Tom Wilkinson, Helena Bonham Carter, and Barry Pepper add a dash of recognizable stars just in case the draw of Johnny Depp isn't enough. Fichtner and Dale are both quite good in their limited roles. Dale just keeps popping up in movies this summer (Iron Man 3 and World War Z previously). It's kind of funny, but this summer has been a pretty nostalgia-filled one for me so far. I grew up watching things like The Lone Ranger and Star Trek re-runs and the Christopher Reeve Superman films with my dad. All three franchises (I hesitate to call The Lone Ranger a franchise but it is obvious that it is their intent starting with this film) have had theatrical releases this summer. I wouldn't have anticipated it, but at different points while watching each of these films, I found myself wishing that I lived closer to my parents so that I could have seen these films with my dad. As I mentioned earlier, The Lone Ranger isn't bad, but there are definitely more worthy films for your hard earned cash this summer. If you like the feel of the Pirates of the Caribbean movies, then this will probably be right up your alley. Other than that I'd feel safe in suggesting that you wait until it becomes a rental before giving it a look. I like the idea and I like the pieces, I'm just not sold on how it was all put together. - The kid that the elder Tonto is telling the story to asks him at one point how he got out of the jail cell. Tonto pretty much ignores the question completely and maybe even waves a hand at it. This is a completely valid question from the kid and it really bugs me when a movie not only has a blatant disregard for such a detail but acknowledges the plot problem and still ignores it. - Why is Tonto part of the traveling fair exhibit? Why is he there as opposed to somewhere else if he is still alive? - Having grown up watching re-runs of the tv show as a kid, I loved the inclusion of The Lone Ranger's 'Hi-ho Silver, away!' line towards the end of the film. What I didn't like was Tonto looking at him like he was an idiot and telling him to never do it again. Since when is Tonto calling the shots? Oh right, it's Johnny Depp and he's too big to play second fiddle. - The director (Gore Verbinski), co-writers (Ted Elliott and Terry Rossio), and star (Depp) all worked together previously on the Pirates of the Caribbean films. Hence the reason for the repeated comparisons in my review.